The track-dedicated 1000PS McLaren P1 GTR will debut at the 85th International Geneva Motor Show in limited production form with only minor modifications to the Design Concept presented just six months ago. The most noticeable change is the livery that the Geneva show car will be sporting. It is one which will be available to the fortunate few who will be joining the McLaren P1 GTR Driver Programme that kicks off at the Circuit de Catalunya in Spain later this year. The design is homage to the yellow and green McLaren F1 GTR, chassis #06R, which has claimed its own place in history as one of the five F1 GTRs that dominated the 24 Hours of Le Mans in the historic debut by McLaren 20 years ago. The McLaren P1 GTR has completed an extensive and intense testing schedule across the world following the unveil of the Design Concept at the Pebble Beach Concours d'Elegance last summer. This has produced enhancements to the original design to optimise aerodynamic performance and cooling. The front track is 80mm wider than the road-going McLaren P1 and with its aggressively profiled front splitter, the also car sits 50mm lower to the ground on centre-locking 19-inch motorsport alloy wheels shod with Pirelli slick tyres. The lower bodywork is trimmed with a sleek aerodynamic blade as previewed on the design concept, which cleans the flow of air along the car's flanks. The lightweight windscreen from the McLaren P1 road car, measuring just 3.2mm thick, has been retained, while the side windows are now motorsport-specification polycarbonate with a sliding 'ticket window' on the driver's side. The chemically toughened glass panels in the roof have been replaced with carbon fibre panels to give the cabin a more enclosed, cocooned environment, as has the engine bay cover. The weight saving measures on the McLaren P1 GTR combine to strip out 50kg over the road-going model. The rear of the track-only model is dominated, in contrast to the road-going McLaren P1, by the presence of a fixed-height wing which sits more than 400mm above the sculpted rear bodywork - an increase of over 100mm of the adjustable wing on the road car. Working in conjunction with the front-mounted aerodynamic flaps ahead of the front wheels, the rear wing helps to increase downforce levels by more than 10 percent - meaning up to 660kg at 150 mph. Mounted on light weight carbon fibre pylon supports, the wing retains the DRS (Drag Reduction System) of the road car, which trims the pitch from 32º to 0º at the push of the button on the steering wheel. Another bold and differentiating feature at the rear are the large twin exhaust pipes, formed from an Inconel and titanium alloy. This system saves in excess of 6.5kg over the already light road-going system. Significant updates and modifications to the IPAS powertrain have been made beneath the 'shrinkwrapped' carbon fibre bodywork. At its heart, the McLaren P1 GTR seamlessly integrates the 3.8-litre twin-turbo V8 petrol engine with an enhanced lightweight electric motor. Combined, these powerplants generate 1,000PS; 800PS (789bhp) is produced by the petrol engine, coupled to 200PS (197bhp) available immediately from the electric motor. The first locations for the first McLaren P1 Driver Programme have now been confirmed, and will see drivers attend an initial test session at Silverstone, England, followed by the first on-track activity at Circuit de Catalunya in Spain. These events will follow on from individual driver profiling sessions at the McLaren Technology Centre. These tailored consultations will include a race seat fitting, a Human Performance Centre assessment, and final discussions around the design and livery of each model with McLaren Automotive Design Director Frank Stephenson. 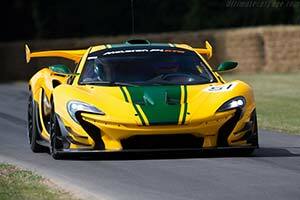 Each driver will also experience the McLaren P1 GTR from the simulator for the first time.